Created 75 years after the event, this famous painting by Emanuel Leutze portrays Washington and his troops crossing the Delaware River on December 25, 1776. Washington was hoping to stage a surprise attack on the Hessians stationed around Trenton, New Jersey. Washington is the main focus here, but next to him, holding the flag, you’ll see the future fifth president. James Monroe doesn’t get nearly as much attention for his military career as Washington, but it’s worth noting what he did for the revolutionary cause. While leading an attack at the Battle of Trenton, Monroe was severely wounded. He fought at Brandywine and Germantown. He also suffered through the harsh winter at Valley Forge in 1777-1778, rooming with John Marshall, future Chief Justice of the Supreme Court. 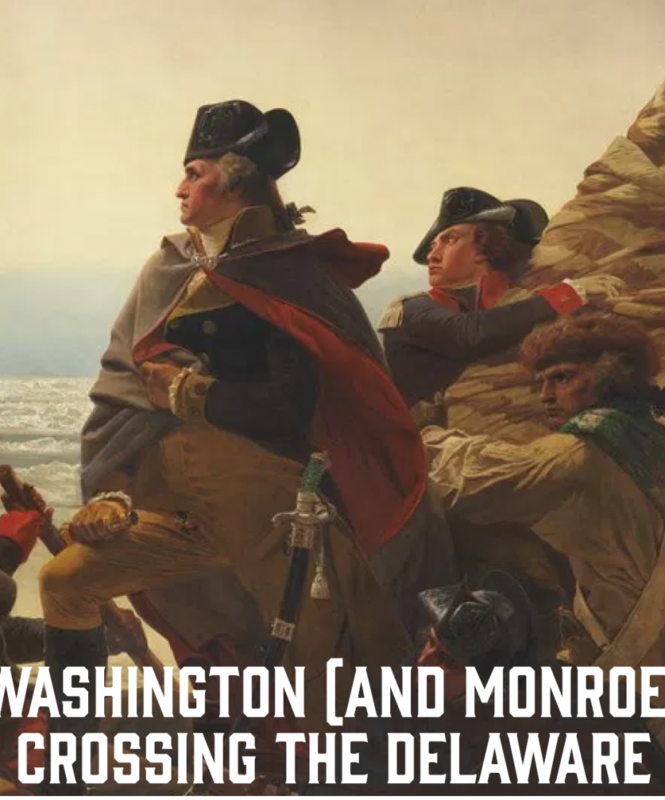 Monroe wasn’t on the same boat as Washington. The American flag design wasn’t used until 1777. Washington and his troops crossed the Delaware in the middle of the night, not at the break of dawn. The boat is really small, perhaps too small to hold that many men. Although historically inaccurate in several ways, Luetze created an artisitic masterpiece, and it succeeds in conveying the feelings of those soldiers’ crossing a river in the middle of winter. Here’s the painting at the Metropolitan Museum of Art.